The Checkerboard Friends quilt block is a Seven Patch block, meaning that it is created using a 7 x 7 grid of patches. This quilt block might look a little familiar as I see commonalities with the Bear's Paw block, although the Checkerboard Friends quilt block has a few more pieces. There is nothing difficult about this quilt block as it contains only squares and half square triangles. You simply need to pay close attention to achieving an accurate quarter inch seam allowance. I have chosen to construct the block as an uneven nine patch, rather than as seven separate rows. I tend to find this an easier method. 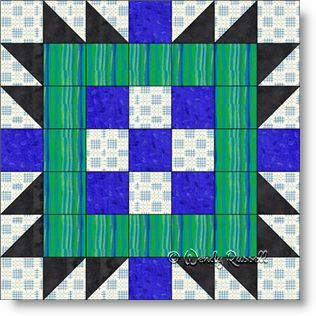 The sample quilts illustrated give you ideas of how you might lay out your blocks to achieve the desired effect you are looking for.